Crock pot roast. This is a wonderful method to cook the perfect dinner. In fact you can get it together during breakfast, head off to work or that golf game or a day at the beach and arrive home to find it ready to serve. Crock pot cooking is an amazing way to prepare a meal. No matter if it is your favorite barbeque chicken recipe, cooking perfect steak or cooking salmon steaks, you must really give crock pot cooking a try with this recipe. This is a very simple recipe, however at the end we will give a few suggestions to make it even better. 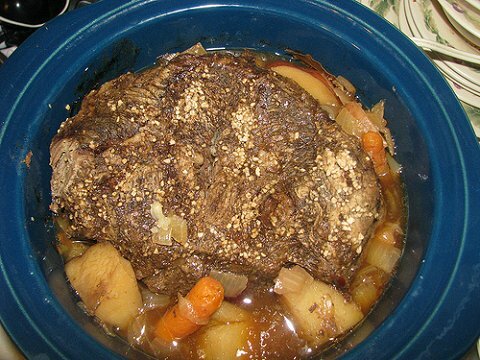 Mom‘s simple crockpot roast recipe. In a slow cooker, mix cream of mushroom soup, dry onion soup mix and water. Place the pot roast in a slow cooker and coat with the soup mixture. Cook on high setting for three to four hours, or on low for eight to nine hours. This makes a very nice roast but some reviewers have stated they would like the gravy to be thickened so they added some flour, salt and pepper and granulated garlic to the mix. One reviewer suggested browning the roast on the stove top first before placing it into the slow cooker and adding one or two cups of mushrooms. Adding beef broth rather than the water helped with the taste. Here is what another reviewer stated. They used beef broth instead of the water, added 2 tablespoons of cornstarch to thicken it up. Three hours before serving they added fresh carrots, green beans, potatoes and sliced onions. The family and neighbors love it. Here is a terrific hint that most cooks will favor. Line the crockpot with a Reynolds oven cooking bag, turkey size or smaller to fit the pot you are using. After your roast is cooked and the time comes to clean the pot, pop the bag out of the crock pot and presto, the pot is clean. Finally, one smart idea that can remove at least 1000 calories form the dinner is to cook the meal in the crockpot the day before, refrigerate overnight, spoon off the fat that accumulated, and reheat the meal in the oven and then serve. Now enjoy your crock pot roast with your friends or family.